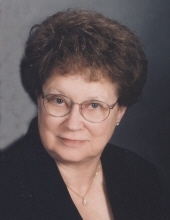 Mary Cornell of New Lothrop passed away April 2, 2019, at age 83. Visitation will be Saturday, April 6, 2019, at Nelson-House Funeral Home in New Lothrop from 11:00 am to 6:00 pm. Mary is survived by her children, Cathy (Rick) Krupp, Patty (Brian) Williams, Matt (Kim) Cornell, Chris (Becky) Cornell, Gabrielle (Allen) Bullock, Stacy (Jim) Hofacker, and Greg (Stephenie) Cornell. She was a loving wife and mother of seven children, 19 grandchildren and 15 great-grandchildren. Mary loved her family and put them before all other pursuits in her life. She loved playing cards, particularly bridge, pinochle and cribbage. Her preferred sport was bowling where she met her lifelong friends. Her passion for board games and group-participation games dominated all family gatherings. She enjoyed cooking but excelled at baking. Her pies, cakes, breads and cookies are legendary. She sent cards to family and friends for every occasion, never missing a birthday, anniversary, holiday or special event. She was born April 20, 1935, and was married to her husband Robert for 62 years before he predeceased her in 2016. Mary was at the forefront of AFS – the foreign exchange student program in New Lothrop and surrounding communities. She hosted students from countries around the world and spent a good portion of her life traveling with Bob to see them in Brazil, Germany, Sweden, the Netherlands, Great Britain and Puerto Rico. Mary was devoted to God and Christ. She loved her Creator, prayed to Him and looked to Him for direction. She never left His teachings and followed His path to her newest position. Please do not send flowers or gifts. Please make a donation in Mary’s name to: Hospice House of Shiawasee County, 2005 Copas Road, Owosso Mi 48867. They gave tremendous comfort to Mary and her family in her final days. Their services are funded entirely from donations and they are invaluable to the community. "Email Address" would like to share the life celebration of Mary Cornell. Click on the "link" to go to share a favorite memory or leave a condolence message for the family.